Last week, Japan's video gaming populace snatched up enough copies of Konami soccer sim World Soccer Winning Eleven 2010 to put it in first place. 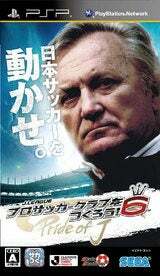 This week, Sega's J-League Pro Soccer Club o Tsukurou! 6: Pride of J scores. New PlayStation 3 debuts like Dragon Ball: Raging Blast and Need for Speed: Shift helped Sony's ratio, but it was the PSP that scored the most spots, with 10 games for the portable platform showing this week. Not all of them showing well, mind you, but enough to secure a top 30 spot.